Only the old(er) folks will understand that title* because I’m going to touch on two topics tonight, the first being my health. Kind of like getting two topics for the price of one. My recent absence was caused by the Return of the Cold or some kind of illness that also brought me to a screeching halt in December. This is indeed unusual for me because it’s only been within the last few years that I’ve been getting sick on a regular basis whereas before then, I was nowhere near any kind of condition I’d consider debilitating. But let me tell you, these colds whipped me these last few times. At least in December, I was on vacation and able to take it somewhat easy. Not the case this time. I had to take one sick day and then opted to only work 4 hours on Friday at the urging of my supervisor and a few co-workers. Nobody likes working with a sickie but frankly, being a contract worker and not accumulating sick pay, I needed the hours so I stayed as long as I could. I go back to work tomorrow and I’m felling better, just not 100%. I’ll manage. Speaking of work, many of you know that my place of employment is about 21 miles from my home. That makes for a reasonably long commute of 42 miles each day. My 2007 Ford Fusion, a car I planned to drive until the wheels fell off, was holding up just fine in every way except one: fuel consumption. On average, I would get 22 MPG city/highway no matter how gingerly I drove. Taking my commute into consideration along with the occasional pizza delivery job another 13 miles from my regular job, it would cost around $31 for a half-tank of gas at around the $3.50 it was just a few weeks ago. Gas prices continue to soar and I don’t see myself going anywhere else in terms of work for a long time, which is why I had been searching the Internet the last few weeks in the hopes of finding something a bit more economical. And while it pained me to give up the comfort of the Fusion, all things considered, it had to be done. My [relatively] new 2011 Kia Rio. With an estimated 36 highway MPG, I think it will work out fine. I had enough money in the Fusion to where they could show the equity as a down payment so we left the dealer** with no out-of-pocket costs. 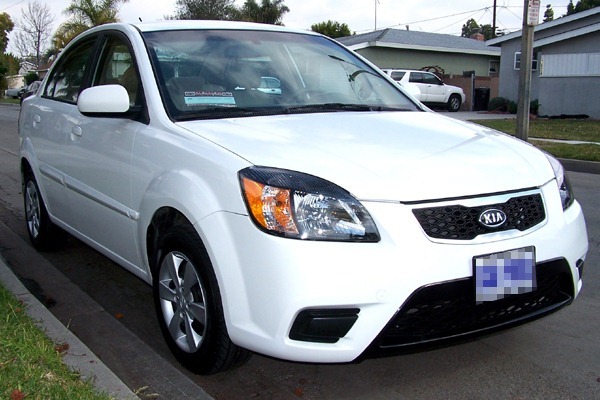 In addition, this little car is still covered under Kia’s 100k/10 Year Warranty so I’m good in terms of major stuff. In the process of my transition, however, I’m giving up a lot of extras. The Fusion had cruise control, fog lights, a six-disc CD changer, power driver’s seat, power windows, power mirrors. The Rio has none of that. In fact, I was completely unaware that manufacturers still produced vehicles sans power windows but this car has proven me wrong. But for some reason I’m drawn to the lack of goodies, plus the addition of an iPod/USB port that allows you to control your iPod through the radio’s big read LED display is pretty cool. So all in all, if I play my cards right and drive in the recommended manner by keeping that little green ECO light on the instrument panel aglow, I should get considerably better mileage than the Fusion ever gave me. I could get a combined 30 MPG average but since I do mostly highway driving, it could be even higher. A side note. While we were coming home from the store today, the prices at my local station were being changed to $3.97, up .02 from what I had paid earlier in the day. I’m pretty sure I made the right choice. *Provided financing is approved which I was assured it would be. **An homage to b-sides. Kids, go as your grandparents then kindly disperse from my property. This entry was posted in Economy, Health, Life, Money by Dave. Bookmark the permalink.